The Freshline QS (Quick Start) tunnel requires minimal upfront investment and is quickly and easily integrated into your existing or new products line, providing you with a flexible, low risk solution. It has been designed with simplicity and speed in mind. The Freshline IQ freezer is designed with economy, efficiency and hygiene in mind. If offers continuous high-throughput on a broad range of foods with easy clean up. Constructed in ten-foot modular sections making it field expandable with minimal up-front capital investment. An optional remote monitoring system allows for trouble shooting or efficiency tracking from afar. The Freshline DM (dual mode) tunnel freezer has been designed with flexibility in mind. In today’s “just in time” production environment, the need to switch from processing one product to another puts time at a premium. The Freshline DM allows you to quickly and easily change from processing individually quick frozen (IQF) products to non-IQF products using the same equipment. Provides the most efficient freezing and cooling without sacrificing sanitation, maintenance, or ease of use. Air Products' Freshline MP freezer gives you the most output from the least input; the best-ever heat transfer from the least floor space; the best hygiene from the easiest cleaning; and the longest operation from the least maintenance. 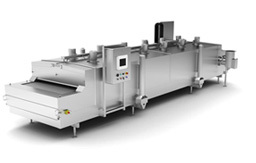 The Freshline Continuous Sauce Chiller is a unique development which, by using the direct injection of liquid nitrogen into practically any liquid, chills the liquid food product within seconds, and permits the manufacturing process to run continuously. Air Products’ liquid nitrogen injection solution (LIN-IS) is designed for fast, consistent and repeatable cooling in mixing and forming of frozen and chilled products. It can be retrofitted to new or existing systems. It’s a high performance temperature control system for you food blending, mixing, grinding, forming, tumbling, pumping and extruding processes.